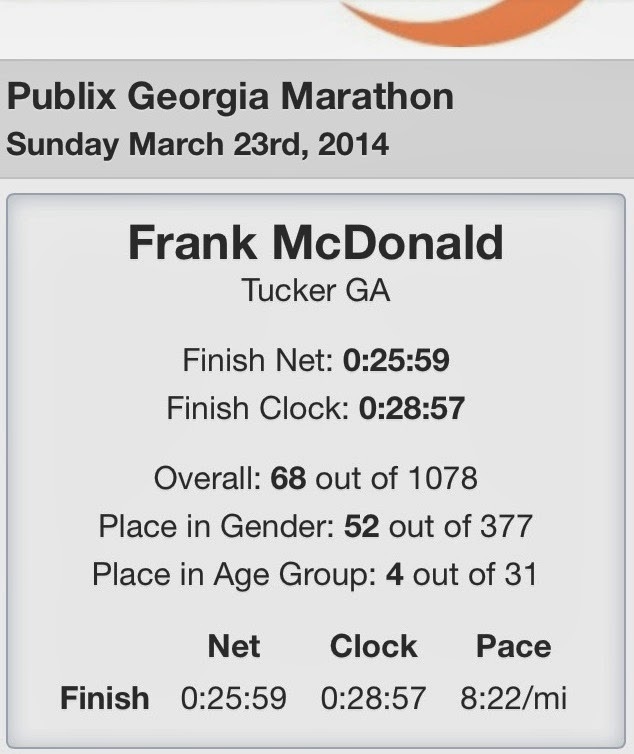 In December, a friend who is an experienced marathon runner challenged me to do the Publix Half-Marathon in March. I had just finished a two-month training period to prepare for my first 10K in the Eastside Beltline race, and was quite certain that I wasn't ready to double again my mileage, at least not that quickly. 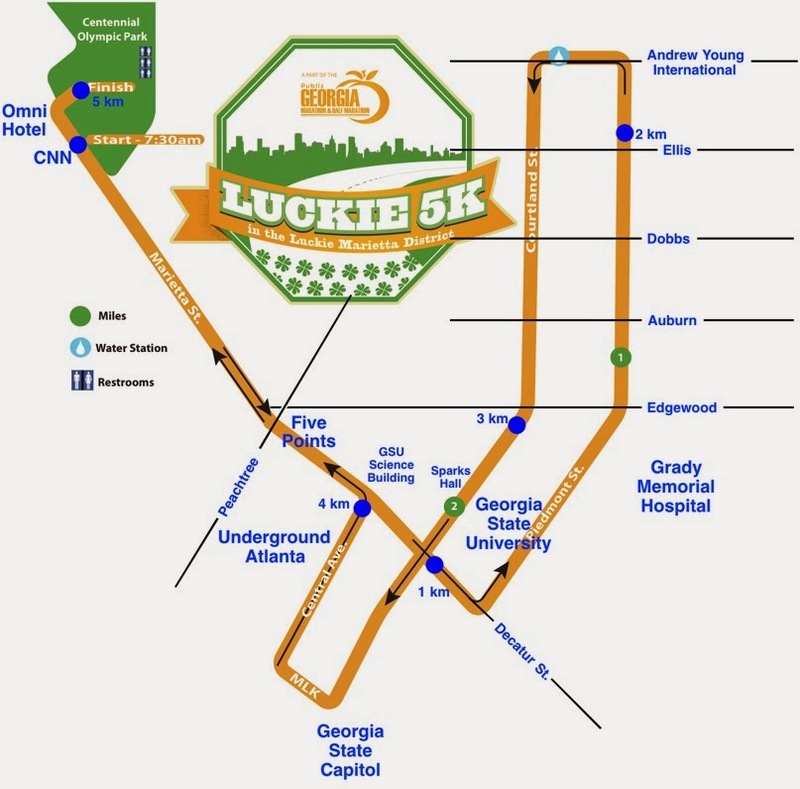 But seeing that there was a 5K associated with the half-marathon and marathon races, I registered for the Luckie 5K, named for the Luckie district in downtown Atlanta. In the meantime, I completed an intense schedule of an 8K, a 10K, and four 5K races. The plantar fasciitis in the left heel was nearly healed, but in recent weeks I began to feel some muscle soreness in the right calf, which worsened in the week leading up to the Luckie 5K. I cut short a mid-week workout, and was careful to ice down the calf on several occasions in the days immediately before the Luckie 5K event. Awakening early in the morning of the race, I carefully stretched at home, before driving to the nearest MARTA station at Indian Creek and boarding the train for downtown Atlanta at 5:20 am. (Thanks MARTA staff for opening up an hour earlier than usual!) The man across the aisle from me was 75 years old and was competing in the marathon. Arriving at the destination station shortly before 6 am, I eagerly joined the other runners through the gate, up the escalators, and around Philips Arena to enter Centennial Olympic Park, the staging area for the race. Over the next hour, the excitement built further as other runners joined us in the park. But almost everyone was wearing a half-marathon bib, and there were definitely more marathoners in sight than Luckie 5K joggers. I found myself feeling a bit of inferiority complex, like I was preparing to run a Tot Trot. But I gamely watched the marathoners and half-marathoners gather in the corrals shortly before the 7:00 am start, hoping that I would be able to join them in 2015. I had debated whether or not I should wear a light jacket over my short-sleeved running shirt, given the temperature of 55 Fahrenheit degrees, but decided that I wanted the protection if it rained later in the race. This proved to be a wise decision, for a different reason: shortly before the start, a strong wind began blowing from the northwest. I would have been really uncomfortable if I had not had the jacket. The marathon / half-marathon race began precisely at 7:00 am, although it took more than 15 minutes for the final group (corral N) to reach the starting line. Then it was our turn, for the Luckie 5K, as the first light of dawn brightened the early morning sky. My inferiority complex largely evaporated as we gathered on Marietta Street. A group of athletic-looking men were clearly vying for a starting position at the front of the pack. Entering the middle of the starting corral, I was quickly surrounded by a rather large group, probably on the order of a thousand runners, with similar distribution of serious athletes as in the best 5K races that I've run to date. The announcer treated our race just as seriously as he had the marathon and half-marathon, which I really appreciated. We even had a VIP address: the lieutenant governor, Casey Cagle, congratulated us on exemplifying the "Healthy Georgians" initiative, and announced that he would be joining our race. After the lieutenant governor's short address, the 5K runners moved up to the starting line. I was in the middle of the pack (once again), but given my sore calf, I decided that was a good place to start, just in case I could not really run properly. After receiving an all-clear from the marathon monitors, the wheelchair racers took off a few seconds after 7:30 am. The announcer gave them a 2-minute headstart, and then our race began, precisely at 7:32 am. The first kilometer: It took a full minute to reach the starting line. I started RunHelper about 10 meters behind the line (so that my arm would not block my bib this time! ), and started a jog as I crossed the starting line. I cautiously tested the right calf, and was immediately relieved. Although the calf was sore, it felt like it probably wouldn't slow me down too badly. The first several hundred meters were slow as usual, but it gave me a good opportunity to begin with caution and gradually increase speed. It wasn't until crossing Peachtree Street that I passed the last walkers and could run unimpeded. The road was slightly downhill, and so I took advantage of the easy start to speed up before completing the first kilometer. Knowing that the final stage of the race would return up this mild hill, now was the opportunity to make good time. As I ran through the underpass at Georgia State University, the one kilometer alert sounded at 5:19. That was not a personal record-setting pace, but a good start considering that I was running two minutes faster than four days earlier, when the calf muscle had kept me from getting up to speed. The second kilometer: One block later, we turned left onto Piedmont Street. The route was level or slightly downhill, and I was able to make really great time, past the outlying buildings and parking garages for Georgia State and Grady Memorial Hospital. Crossing Edgewood, I noticed trolley tracks in the street and recalled reading something about a streetcar line returning to downtown Atlanta. At Edgewood, Piedmont Street turned due north. The route was still easy. For a race that starts and finishes in nearly the same area, every runner should know that "what goes down, must come up." (Isn't that sort of like the lyrics of a song from ca. 1970?) So I slightly leaned forward to extend my stride and take maximum advantage of the gentle downhill stretches. I was occasionally passing other runners, was occasionally passed, but felt that I was doing well overall. I passed the one-mile marker with the clock showing 9:05 minutes, which subtracting a minute before crossing the starting line, would put me at about an 8 minute per mile pace. Not bad at all. Crossing Ellis Street, the alert for completing the second kilometer sounded at 10:03 elapsed, 4:44 for the second kilometer, average pace right at 5 minutes per kilometer. The third kilometer: The road continued downhill for one more block to Andrew Young International Boulevard, where we turned left. By reviewing the elevation map in advance (and having driven this way into downtown Atlanta on many occasions), I already knew that the road would be uphill, and maintained a good pace. Fortunately this was only one block, and our route would not take us up the steepest part of International Blvd to Peachtree Street. I intentionally stayed well to the right of a water station on the corner of International and Courtland Street, planning not to stop for a water break in such a short race (although as soon as I passed, I realized that my mouth was starting to feel a little dry...), and made the left turn onto Courtland, heading due south, back toward Georgia State. The road continued to go uphill, but fortunately the hill was not very steep, so it was managed without much difficulty. Levelling out again, the alert for completing the third kilometer sounded as I crossed the trolley tracks again. 15:20 elapsed, 5:17 for the third kilometer. I was really pleased, as most of that kilometer had been uphill. The fourth kilometer: As Courtland turned slightly to the right at Edgewood, we reentered the campus of Georgia State. I recognized Sparks Hall as one of the GSU buildings adjacent to chemistry, as the road went uphill to the overpass over Decatur Street. I knew beforehand that this would be the hardest part of the race. Although I felt myself slow down a bit, I was happy that my conditioning allowed me to pass quite a few other runners in this section. I passed the two-mile marker showing 17 minutes and some seconds. Had I really slowed down that much? Then I remembered to subtract a full minute due to the delay in crossing the starting line. The golden dome of the state capitol building appeared ahead and to the left, but I could hardly take more than a quick glance at the grounds of the capitol as we turned right onto Martin Luther King Drive. After one short block we turned right again, onto Central Avenue. This stretch was, surprisingly, also uphill for the first block, even though we would be rejoining Decatur Street just one block from its underpass. At the top of the hill, I realized that the toughest part of the race was (probably) over for good, as we passed the entrance to Atlanta's tourist trap Underground Atlanta. The four kilometer alert sounded as I made the left turn onto Decatur Street, to the finish line. 20:42 elapsed, 5:22 for the fourth kilometer. Another good stretch even with the uphill sections. The fifth and final kilometer: I recognized the old Science Building at GSU as I made the turn onto Decatur. The right calf was a bit sore and I was a little tired, but was feeling stronger than in other races at this stage. I think that it was because there were no difficult uphill stretches. Of course this last section was uphill, but not severely so. I tried to find the intersection with Peachtree Street, where Decatur Street changes names to Marietta Street, but somehow didn't pick up on the fact that I had passed through Five Points, traditionally regarded as the center of Atlanta, until I could see that the street was labelled Marietta St. I think that it is because the park at Five Points is at the intersection of Peachtree with Edgewood, rather than Peachtree with Decatur and Marietta Streets. How many more blocks to Centennial Olympic Park? Then I saw the sign for CNN Tower ahead and to my left, and that spurred me on. Everyone in my area was running a little faster, sensing that the end of the race was near, and I could hear the voice of the announcer. I spotted the starting line, ran through it, and turned right for the final dash to the finish line inside Centennial Olympic Park. As I cleared the intersection, the announcer was calling out names of runners, and then I heard my name called as I neared the finish line. I smiled and raised my arms in the air. Very nice touch on the part of the organizers! I crossed the finish line, seeing a time just short of 27 minutes. Substracting a minute, I was pleased to realize that I finished in about 26 minutes, maybe a few seconds under. Later I determined that I finished the last kilometer in 5:17. Postrace: The volunteers were great, handing out finisher medals, water, a light wrap, and then inside the park, cheering us as we received a snack pack. The right calf began to stiffen up, so I stretched out both legs before devouring the contents of the snack pack. While I waited for Bonnie to arrive downtown, and for friends to finish the half-marathon (which they both did, in just under 2 hours) I watched some of the earliest finishers in the half-marathon. Although some runners looked fairly strong at the end, most looked pretty beaten up after 13.1 miles. Hmm, maybe I should think carefully about whether I really want to take on a half-marathon. After the two hour mark had passed, I walked to Marietta Street just north of Centennial Olympic Park, to look for Bonnie as well as watching for the winner of the marathon. More than a few runners were limping, although the appearance of their faces was generally a little better, probably due to the slower pace. Shortly after 2-1/2 hours, the winner of the marathon breezed by the rest of the pack in a dedicated lane. I attempted to take a photo, but my phone discharged at the very moment! Fortunately I had brought a charger battery and so I wasn't out of touch for long. I finished the morning with brunch at the Ritz-Carlton, with Bonnie and our friends who had completed the half-marathon. They will be running in the Boston Marathon next month, so today's race was just another training day for them.